This article explains the Consumer Trend Canvas in a practical way. After reading it, you will understand the basics of this powerful Marketing method. In this article you can also download a free editable Consumer Trend Canvas template. 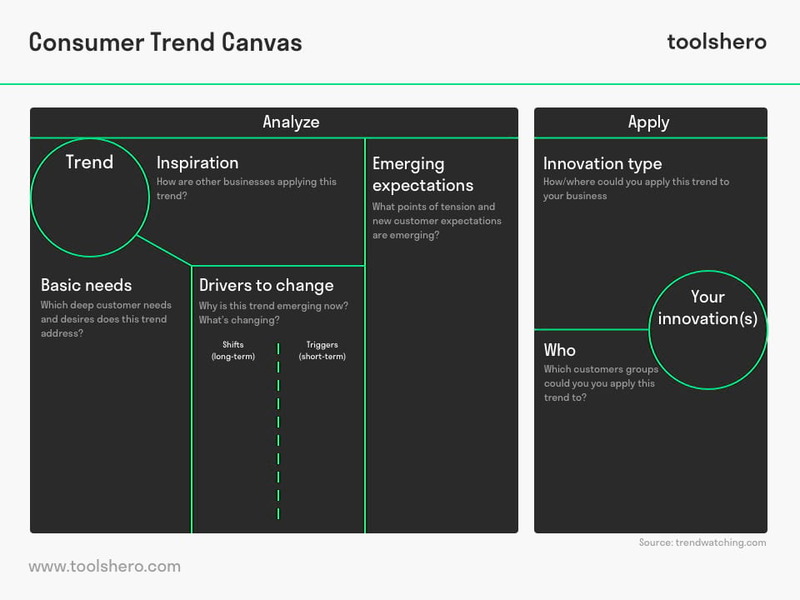 What is Consumer Trend Canvas? For companies, the knowledge they can get about their customers and other potential consumers is invaluable. Consumers follow trends and are let themselves be led by them. However, trends are abstract and not always tangible. These Consumer Trends provide essential information, which allows companies to get a grip on the possibilities of innovation opportunities. By responding to trends, companies can focus on better the consumer. That’s exactly what the Consumer Trend Canvas can help with. This model is a demand-driven approach that can clearly show what consumers want and how a company can best develop and innovate its products. With a Consumer Trend Canvas, a company gets the chance to collect and analyse consumer trends. This information can then be converted into innovative and business opportunities. It’s a simple model and comparable in size to the Business Model Canvas. The Consumer Trend Canvas is divided into two sections; Analyse and Apply. Both sections have a total of seven components that will then be mapped out. The Consumer Trend Canvas can best be created on a large sheet of paper (A6 size), that has been divided into two halves. The Analyse section and its four components will be on the left. On the right side, put the Apply section with the three other components. Once you’ve chosen a trend, the Consumer Canvas can be filled in. Under Analyse, you can write down information. The focus should be on the different components in this section. This way, insights into one component can emphasise other elements of the trend. This helps a company to potentially discover new concepts. In the Apply section, it’s considered how, where and for what type of customer the trend could be applicable. Eventually, all this information can lead to new innovation ideas, that correspond to what the customer wants. As a result, it’s almost likely that these innovations will be successful. Below, the components per section are briefly explained. This is about the deeper needs and wishes the consumer has for the chosen trend. The underlying needs and desires need to be identified. This can be anything, like the need for a specific social status or connection, or even the search for one’s own identity and recognition. When it becomes clear why the consumer lets himself get swept up in a trend, a company can respond better and adjust the innovations accordingly. These focus on the question why this trend is happening. With trends, it’s about changing things like behaviour, but also about social changes. This decides the specific taste of the consumer. Fashion in particular is subject to this and constantly changing. In addition, external factors from the macro economy cause change, such as demographical changes, economic cycles, political events, environmental changes and specific technologies that have a strong influence. This is about the new needs and expectations of consumers, which are the result of the changes in the macro surroundings mentioned above. It means that you first have to fill in one area of the Consumer Trend Canvas, before you can fill in another. New consumer trends arise in moments when current desires and needs change under the influence of people’s surroundings. By identifying these unfulfilled needs, a company is ahead of the trend and can respond to this with new innovation opportunities. In this part, the main question is how other companies deal with and respond to the trend. It gives inspiration to know what other companies and organisations do when it comes to current trends. Successful innovations are created by combining your own ideas with those of others and placing these in a new context. Vision: it’s smart to question how much the innovation demanded by the trend, will determine the company’s long-term vision. Business model: the question is whether the trend can be used to launch a new product, new brand or even a new division. Product: a new trend – in most cases – comes with the development of new products and different services. Therefore, a company must ask itself what impact that will have on the current product range and whether adjustments are needed there. Campaign: the new trend and the innovation developed as a part of it must also be made known to the consumer through a campaign. This should be handled with care and caution; what needs to be communicated and in which way, so that the consumer feels like they are being addressed personally. This part seems self-explanatory, but is still very important. The company can’t simply assume that the current consumer is going to go along with the new trend. Beforehand, it needs to be carefully considered to which current and new customer groups the trend and the innovations that will be made by the company apply. With consumer trends, the company is well advised to think about what about the trend is relevant for the customer. In this last part, the company thinks about how the previously collected information can lead to innovations. It should be noted that it’s not only about creativity, but also about the profitability of the organisation. What deeper consumer needs and desires play a part in the trend? Why does the chosen trend stand out? What changes as a result of the trend? What new consumer needs, desires and expectations will arise as a result of the changes caused by a trend? What is it that the trend gives to the consumer? How are other companies handling the new trend? How are these other companies applying the trend? How and where can the company itself implement the trend? Which current and new consumers can be reached with the new trend? What should the company change in order to be part of the new trend? By answering all these, and possibly other open questions, companies have a simple and effective way of finding out what causes trends and how this can lead to potential innovations. The power of the Consumer Trend Canvas is in its simplicity and in the possibility to immediately implement it in operational management. Now that you have read about the Consumer Trend Canvas, you are ready to bring your knowledge into practice. Start describing the different customer needs, expectations and possible innovative solutions with our free Consumer Trend Canvas template. This template is available as an editable Word template or as a printable PDF template. What do you think? Have you ever heard of the Consumer Trend Canvas? Do you recognize the practical explanation or do you have more suggestions? What are your success factors for getting a grip of innovation possibilities and responding to trends? Link, P., & Lewrick, M. (2014). Agile Methods in a New Area of Innovation Management. In Science-to-Business Marketing Conference (pp. 3-4). Mason, H., Mattin, D., Dumitrescu, D., & Luthy, M. (2015). Trend-Driven Innovation: Beat Accelerating Customer Expectations. John Wiley & Sons. Witzel, M. (2005). Managing customers as investments: the strategic value of customers in the long run. Corporate Finance Review, 10(3), 43.